From the world of “NEVERLAND” in 2017, in 2018 NEWS takes you on a journey into outer space onboard the EPCOTIA Liner – flight 009; NEWS hosting as the 4 flight attendants. A tour based around their album released in March 2018, NEWS once again immerses you into the theme of the album, which has been a “thing” for them since their 2015 album “WHITE”. In this review, I will be discussing 2 categories – Theme and DVD contents – to give an overall rundown of the DVD itself and if its worth it to buy. Let’s begin with Theme! To be honest, I was skeptical of this space theme from the minute I saw the names of the songs on the album that were basically all a bunch of space themed words thrown together like “BLACKHOLE” and “UFO”. 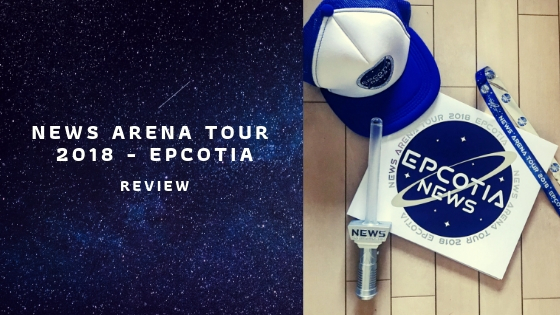 Nothing could top NEVERLAND (tour and album) for me… it was the perfect theming for a group like NEWS who is bright and has bouncy songs with some rock thrown in from time to time, so EPCOTIA had a lot to live up to… and I think NEWS was feeling the pressure too. Before going into the tour itself in April, I liked about only 50% of the songs but after seeing the tour in Hiroshima I was hooked on about 90% of them for the performance. You can tell NEWS made an extensive effort to separate NEVERLAND from EPCOTIA as themes, and to not make it a continuation (despite NEWS doing theming for N-E-W-S for the next few years) . NEVERLAND had a more steam punk feel to it with the costumes and had a more typical stage setup for NEWS, while EPCOTIA was a center stage and more “futuristic” with monochrome theming and costumes, lots of strobe light affects and a center stage where they really pushed the limits with what they could do with it. (Bungee jumping around the stage in the middle of the concert, hanging from the celling during the opening and having a huge model space shuttle on the stage? Now THAT’S entertainment!) I felt they had a higher budget this year as compared to previous years, as it was their 15th anniversary and probably after the success of the NEVERLAND theming the year previously. Also, on a side note, the tickets were adorable with “Boarding Pass” written on the back of them with the EPCOTIA logo on it … the theming was on point the entire time from beginning to end. I think with NEVERLAND they pushed the limits for theming where they had fallen short with QUARTETTO the year previous and then with EPCOTIA, they really took what they learned with NEVERLAND and ran with it full speed ahead. CONTENTS – less than previous DVD’s? Credit to Johnnys Entertainment Inc. The contents of the DVD are very straight forward this time around, containing only the final day of the tour in Saitama Arena in May 2018 plus “EPCOTIA MULTI ANGLES LIVE”, which special to just the limited edition of the DVD. The only difference between the Regular Edition and the Limited Edition is this “Multi Angles live” for both the Blu-ray and DVD versions. Click HERE for all the information on what the DVD contains (Japanese Only). I thought the Multi Angles live was a smart move on Johnny’s part to keep the budget low: Take footage of a handful of songs that they already had recorded at the concert and release it at different angles. Essentially, they have cameras pointed at each of the members during the concert at all times and they compiled that footage of 4 of the popular songs, LIVE, BLACKHOLE, Erotica, and U R not alone for each member’s angle. Not just that, but you don’t have to choose just 1 member for the entire time, you can choose different members for different parts of the song, letting you control the editing of the song and how you want to see it. I thought you could only choose 1 member for the entire song, but I was happily surprised you can choose the angle at each point in the song. Very interactive, as there are so many combinations you can make between the 4 members’ parts. If you can get your hands on the Limited Edition of this DVD, I think it is worth it for the multi-angles lives, but the Regular Edition doesn’t have much to offer besides the actual concert. With that being said though, I can’t wait to see what they have in store for the VR themed “WORLDISTA” for 2019!